At only a modest two months late we find ourselves at the last post of the 2014 No Girls Allowed Quilt Bee! It’s fitting that the bee should come full circle, ending with the founding father, Molli Sparkles. Mr Sparkles needs no introduction, having already left his glittery stamp on the modern quilting world in far more impressive ways than I could describe here. I count myself so fortunate that I was able to connect with Joshua way back when, and am both pleased and proud of where our interaction has taken us. For the final month of the bee, Joshua requested hash tag blocks in a rainbow of tone on tone colours. Now, as the tutorial so helpfully suggests, a test block is indeed a mahvelous idea; if you haven’t nailed down that exact quarter inch seem, your block isn’t gonna grow up to be the right size. Trust me; I have an orphan block stuck to my design wall to prove it. Once I sorted the seam issue, I sewed up a storm, choosing to focus my fabric selections on the teal and yellow areas of the colour wheel. Since I made blocks for Mr. I’ve grown quite an attachment to fabric arranged in colour order, so it was great fun to pull these. Tula makes an appearance, as does some great small-scale prints that seem to be the staple of my stash. I can’t get enough of fabric like that! 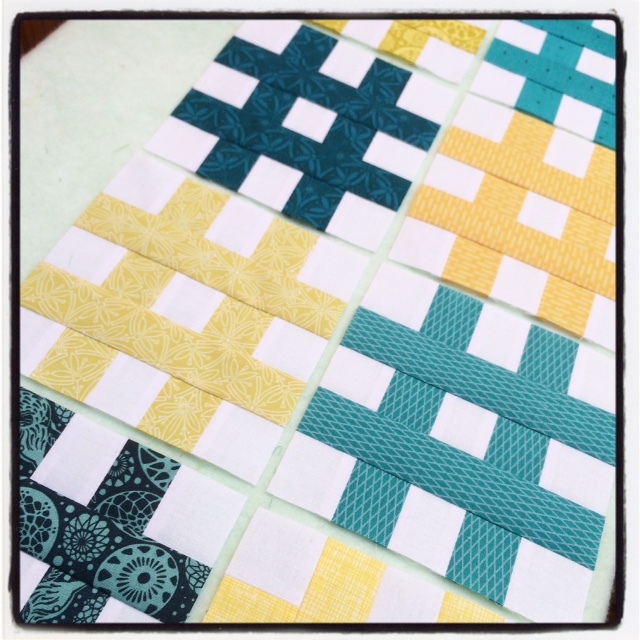 If these blocks seem familiar, you’ve probably seen a ton of them crop up on Instagram as part of the Sew For Sydney movement Joshua initiated to help victims of the Sydney terror attacks. It was a real call to arms, with hundreds upon hundreds of blocks from all over the worlds being sent to help the cause. What a great bunch you all are! And with that the bee comes to an end! Mark me off the list gentlemen, I’m officially up to date. What fun the whole experience of being in a bee has been! I’d stumbled upon the word many times in the early days of my foray into quilting, and was eager to be involved in one. Well, I couldn’t have wished for a nicer bunch of bee mates. I’ve learnt so much from these guys and can’t wait to see what they all get up to in the future! I hope you’ve all enjoyed taking this journey with me. Be sure to keep your eyes open for the finished quilts over the coming months. They’re going to be ace! Hashtags are a great idea for a quilt. You’re look great! It was a pleasure and an honour sewing along side you for the past year! What will we do now?! ?